Now that Starbucks is adding booze to its menus nationwide, it's only a matter of time before they turn into a full fledged nightclub when the sun goes down, albeit one with a staggering collection of Norah Jones CDs. Luckily, one comic is already testing out her unsolicited services as an Sbux bouncer. 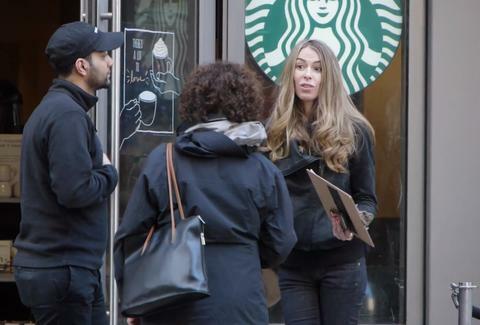 Armed with nothing more than a clipboard and a velvet rope, Jena Kingsley parked herself outside a Starbucks and started asking bewildered patrons if they were "on the list", turning them away if they were hesitant or not a hot girl. See what happens before the popo baristas shut her down. Kristin Hunt is a food/drink staff writer for Thrillist, and has many lingering questions about the vacuum guy. Follow her private investigation at @kristin_hunt.